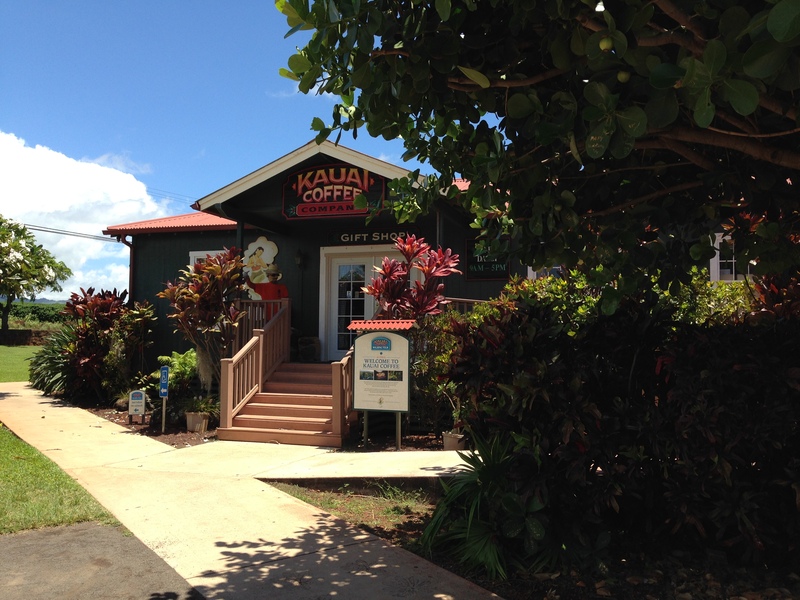 It’s been a while since Brett and I have been to the west side of the island, but we’re making plans to go down that way next week, and one of our stops will be the Kauai Coffee Company. 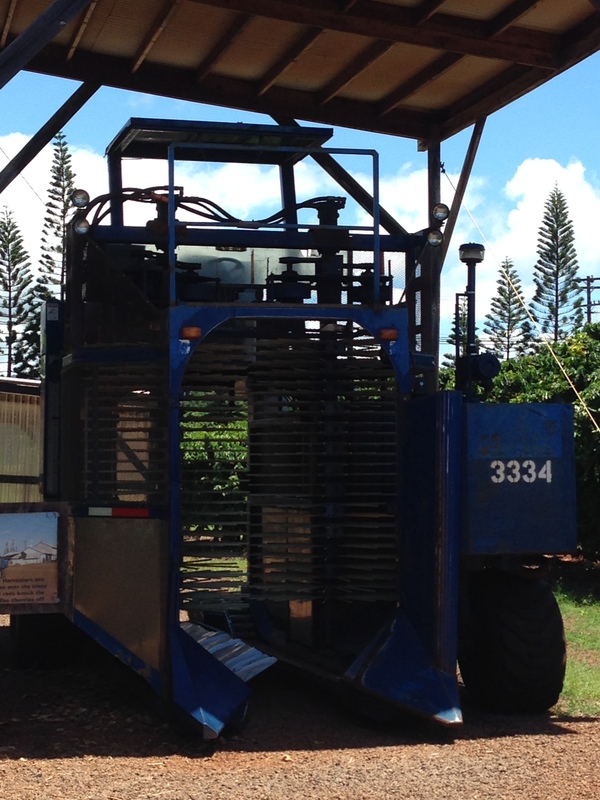 KCC is the largest coffee estate in the United States, covering over 3,000 acres on Kauai’s west side. 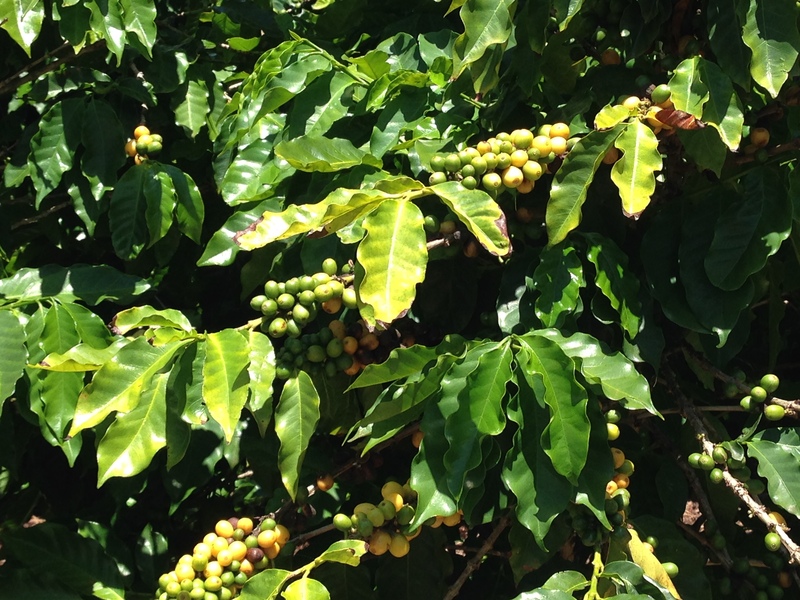 Over four million coffee trees grow in the island’s rich volcanic soil, and are fed with water from Mt. Wai’ale’ale. The drive to the west side is lovely, with sweeping views of the ocean and out to Niihau island (privately owned by the Robinson Family, Niihau is off-limits except for the Hawaiians who live and work there). After turning off the highway just past the town of Kalaheo, but before reaching Eleele, signs direct you down through the coffee estate to the visitor center. 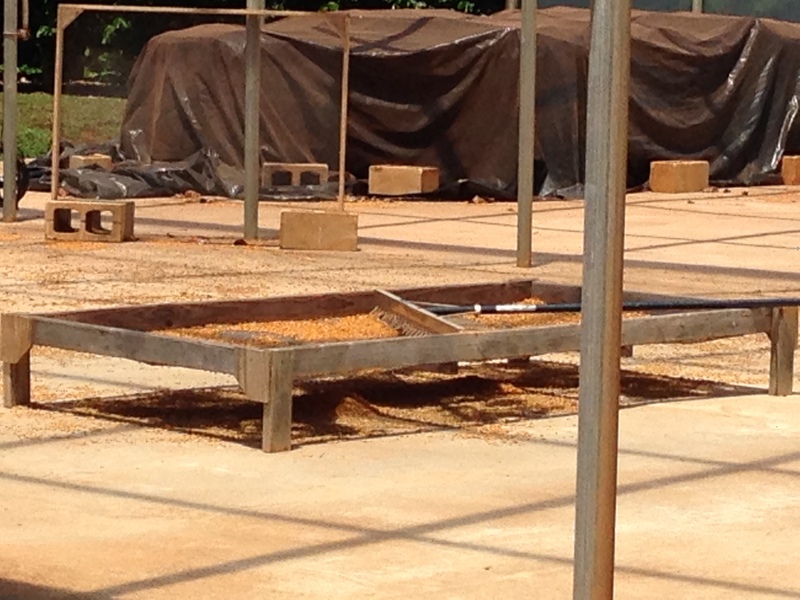 From here you can take a short walking tour that gives an overview of the coffee growing, harvesting, and roasting processes. 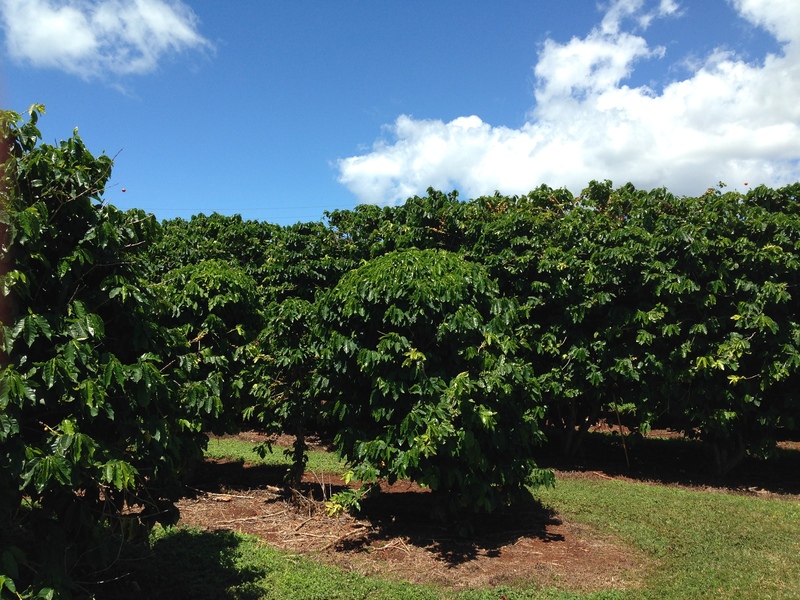 Row after row of coffee trees . . . The best part of the experience however is waiting at the end of the tour: the tasting room! If you are a coffee lover it’s like reaching nirvana. There are nearly 20 varieties of KCC coffee available to sample, from light to dark roasts and specialty varietals, as well as several flavored coffees . . . for free (I don’t particularly care for flavors when it comes to my coffee, but KCC’s chocolate macadamia nut is an exception). 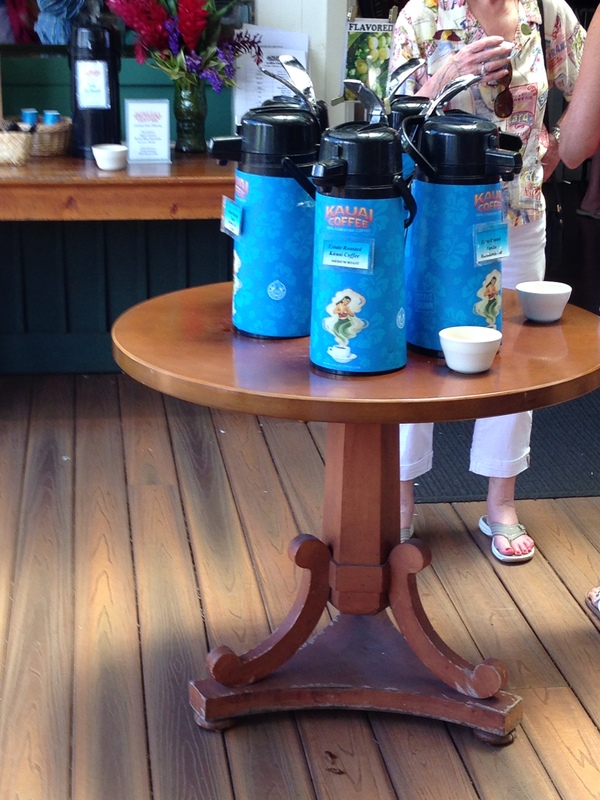 All the coffee is 100% Kauai grown and roasted – no outside beans are included. You’re welcome to try as much and as many as you like (cream and sugar are provided). You can purchase your favorites or other KCC-related items, including gift packs and coffee samplers, in the attached gift shop before you head for home or to other west side locations (some of the flavors and varieties can only be found at the gift shop). 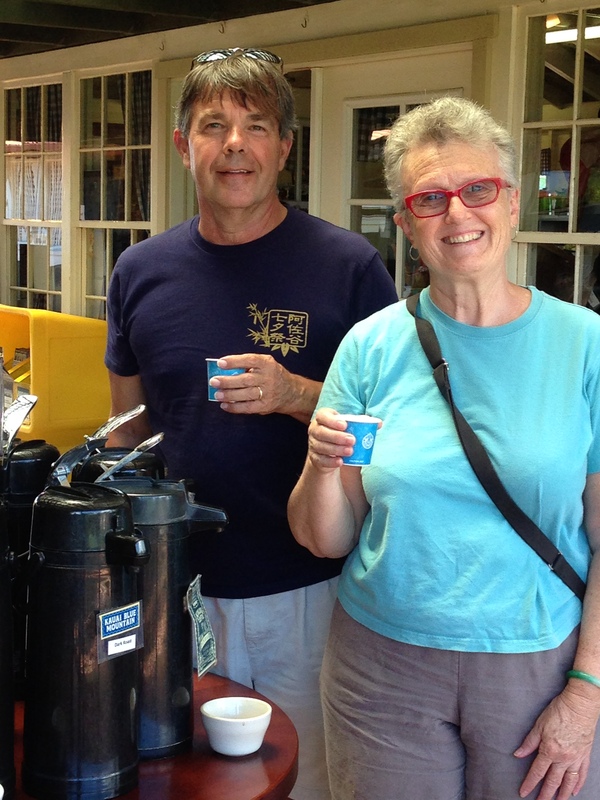 Getting our coffee buzz on in 2014. Jealous, jealous, jealous!!! Jim and toured there last year, and this year we stopped back by again to pick up a mug and a t-shirt. We now have their coffee delivered to our home, instead of buying Starbucks! We have not been there for over a year, but have some other errands on the south side so Brett and I thought we’d make a day of it. We’re not crazy about some of KCC’s coffee, but some of it is very, very good, and getting to try all of the different blends/varieties is so much fun. We’ll probably pick up some of the flavored coffee this time (and use our kamaaina discount). 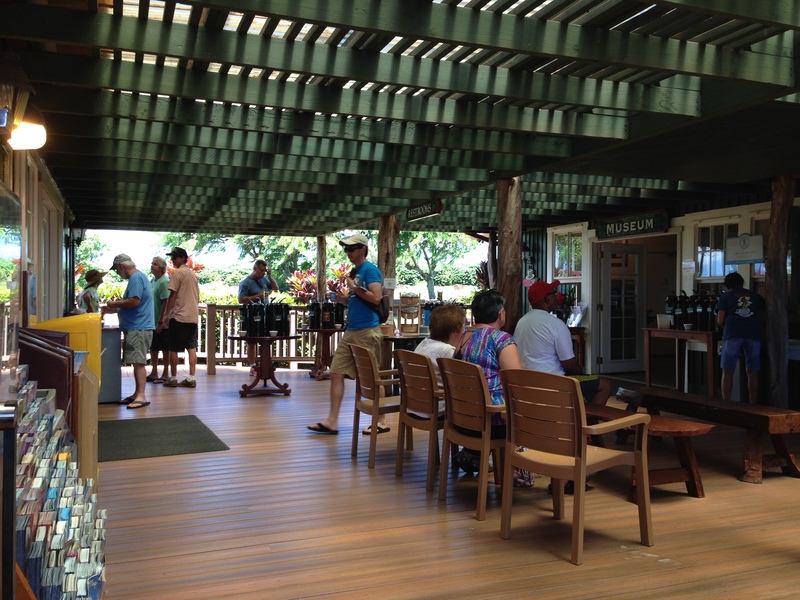 LOL – Brett thinks we also need to stop at Kilohana Plantation for a rum tasting!